The way Ancient people replaced their lost teeth is unbelievable. From animal teeth to hammered seashells – they used all of these unique mediums to regain their smiles. The best thing about living in this generation is that you can now get a solution to your problem more conveniently. As for the case of losing a tooth or two, dental implants are made available. Removable oral appliances like dentures are the traditional way of replacing the lost teeth. However, the hassles brought by unstable prostheses encouraged people to settle for a much comfortable restorative option. 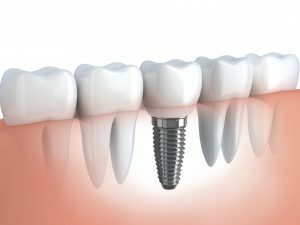 Dental implant fuses into the jawbone, making it an ideal solution for missing teeth. It has a high percentage of success rate so you can feel at ease that your investment with implants is worth it. We will monitor the state of your teeth replacement and perform any adjustments if necessary. Despite dental implants being a stable type of restorative device, they tend to become loose after several years. Having it checked by the dental professional is the best consideration. Furthermore, seeing the dentist twice a year does not merely keep your implants in tip-top shape, but your overall oral health is nourished as well. Dental implants are artificial replacements, but they too deserve the right cleaning routine like real teeth. Remember, they are designed to look and function like your natural pearly whites, so you should keep taking care of them in any way possible. Start by including them in your daily brushing and flossing activity. The mouth is home to thousands of bacteria. While some of them are helpful, there are those that are not. They may even wreak havoc on the person’s oral health. Prevent the development of unwanted bacterias in your mouth by rinsing with a mouthwash. You can ask us to know which product is best suited for you. Dental implants are long-lasting. By following the tips mentioned here, you can ensure both the healthy state of your restoration and oral structures! For more information about Dental Implants in Johns Creek, GA, be sure to contact Shawn A. Walls, DDS today. Our entire team looks forward to meeting you in person and helping you achieve the best possible dental health results. Visit us at 10700 Medlock Bridge Rd., #202, Johns Creek, GA 30097 to get started on your new smile!